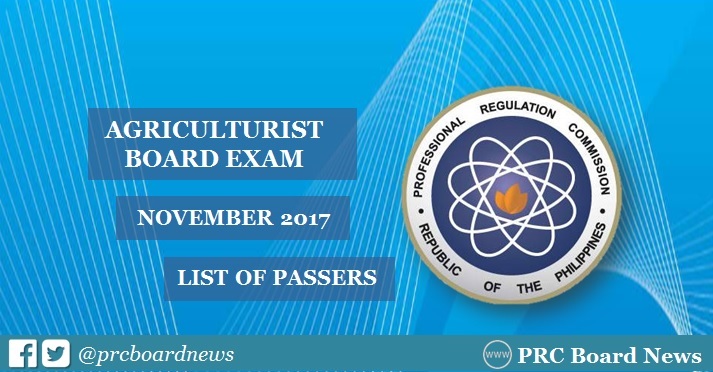 MANILA, Philippines – The Professional Regulation Commission (PRC) and the Board of Agriculture released results of November 2017 Agriculturist board exam expected on Thursday, December 7, or in five (5) working days after the exam. The official list of passers, top 10 (topnotchers), top performing schools and performance of schools are available on this page as announced online. UPDATE: 2,883 out of 7,537 passed the exams. The three-day exam covered the following subjects: crop and soil sciences, crop protection, animal science, agricultural economics and marketing, agricultural extension and communication and post-harvest technology. According to PRC Resolution No. 2016-1019, the target release of results for the November 2017 Agriculturist board exam is on Thursday, November 7 or in five (5) working days after the exam. In the April 2017 Agriculturist board exam, results were announced in four (4) working days after the last day of tests. A total of 927 out of 2,938 passed the series of exams. None of the schools qualified for the top performing schools list according to Commission Resolution No. 2010-547 series of 2010. In the same period last year, results were out online in five (5) working days. A total of 1,790 out of 5,795 passed the examination. University of the Philippines (UP) - Los Baños was the only top performing school with 96.83% or 122 out of 126 passed the exams. Asan na results ng Agriculturist board exam? Good day po, san na po ang result? nasaan na po yung results? Ni ready lang nila ang website, but hindi pa na-upload yung list. Probably mga 11pm pa ma-popost yun. how will we know kung kailan po ang oath taking? Is it compulsory at lahat po ba ng takers (nationwide) isa lang po ang venue which is MANILA po ba? These result shows us about what is going to be helpful for students. The career building acts are very better so go to https://www.summarizing.biz/our-summarizing-and-paraphrasing-services/summarizing-data-service/ and take whatever you want. That official result for the students passer list. You can check http://www.admissionsessay.net/services/admissions-essays-writing-service/medical-school-admissions-essay-writing-service/ more list which is non mention in this site. Educators ought to be worried over the possibility of substance written in task. They should check how well the presentation is framed, how they made basic body and end. Great site, There are boundless ramifications of the rule in any case in an essential philosophy, the bearing is a deed or methodology for bypassing on or here here completed vision, developing the ability to reason.